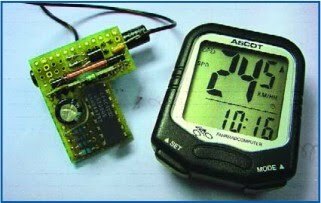 The idea for this circuit came when the author had problems with the wireless speedometer on his bicycle. Such a device consists of two parts: the cycle computer itself and a transmitter that is mounted on the front fork. A small magnet is attached to the spokes so that the transmitter sends out a pulse for every revolution of the wheel (as long as everything has been fitted properly). Since the range of the transmitter is limited (about 75 cm), you’ll be lucky if it works straight away. And when the voltage of the battery starts to drop you can forget it. The following circuit gets round these problems. A Shimano NX-30 hub dynamo has 28 poles. This results in 14 complete periods of a 6 V alternating voltage per revolution (when loaded by a lamp; under no load the voltage is much higher). C1, C2, D1 and D2 double the voltage of the AC output. Regulator IC2 keeps the voltage to the transmitter and the divider IC at a safe level (12 V, the same as the original battery). The divider chip (IC1) divides the frequency of the signal from the dynamo by 14, so that a single pulse goes to the transmitter for every revolution of the wheel. This pulse enters the circuit at the point where the reed contact was originally. The circuit is built inside the front light, since it has enough room and a cable from the dynamo is already present. The distance to the cycle computer is smaller as well in that case. The following tip can be used if you want to save yourself a few components. In the author’s prototype the counter divided by 16 and the setting for the size of the wheel was adjusted to 16/14th of the real size in the setup of the cycle computer. In that case you can leave out D4, D5 and D8.